If we can make ourselves ill - through stress, poor diet, lack of exercise - it stands to reason we can make ourselves well again. We are all subject to stress, but suppressing it or denying it only reinforces its strength, and allows it to remain in the body where it can block energy, upset our natural vibrations and cause dis-ease. 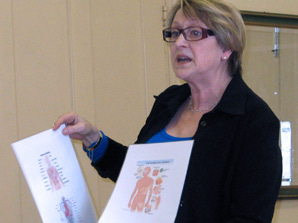 In her talk on Thursday 8th March, Diane Holliday, nutritionist, allergy specialist, kinesiologist, EFT-practitioner and dowser, revealed that in her twenties she had been seriously ill and could not find any doctor able to help her. In the end she cured herself, first by confining herself to a very limited diet, and then by gradually reintroducing foods one at a time, in order to monitor their effect on her. She also taught us a technique to heal ourselves. Imagine a bright light on the end of your finger; place it gently in the mouth and envisage the healing light travelling throughout the body to the place that needs healing. We have to help, of course, by ensuring we eat the right foods and get enough of the right exercise and fresh air. Minerals and vitamins in the body are in a very delicate balance, too much or too little, and a lot can go wrong. One of the main vitamins many of us have in depleted levels is Vitamin D, which the body mainly makes for itself using sunlight. Yet we slather ourselves in Factor 30 sun-block and wear sunglasses which effectively stops sunlight reaching the body, or being absorbed, which means we can’t make enough Vitamin D. All living organisms need sunlight! There is more to wellbeing than a mere absence of disease or infirmity. We need good physical, mental and social health to feel well, happy and whole. The mind is far greater than we recognize; negative thinking, anger, hatred or bearing a grudge can lead to depression and defeat, whereas positive thinking and letting go of anger, can lift us up and make us feel well again. Our next meeting is on Saturday 24 March when Chris Strong will show us how to dowse to find lost objects, people, pets and ancestors. We will then repair to the Tudor Arms in Slimbridge for some lunch and socialising afterwards. Getting to know our fellow group members is wonderfully supportive. All welcome.